For Fannypack’s birthday dinner, I chose for us to head to Downtown via the Canada Line. It’s convenient and since Fannypack and O haven’t been on it before, I thought it’ll be fun. First up I made birthday girl get a drink. Obviously it was a ploy so that I won’t be the only one drinking. Their cocktails are separated into Tall and Short, with the Tall being $7.90 and the short $6.90. Fannypack and I both ordered from the Tall menu. 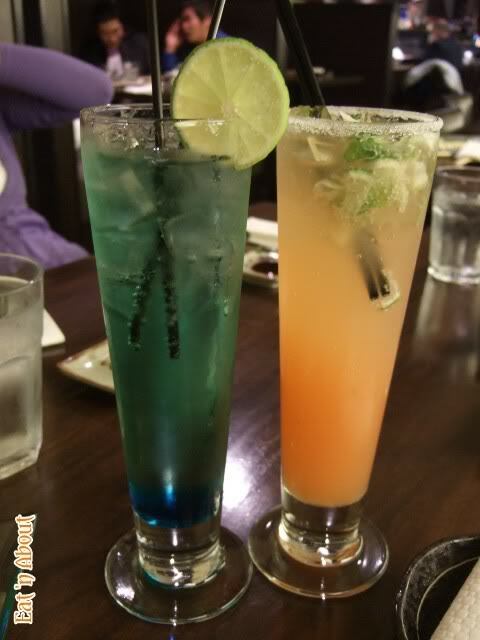 On the left is the Natsu which translates to Summer (I know, wrong season but what the hell~). It’s a bubbly drink which is quite sweet (right up my alley). There is Blue Curacao at the bottom and I really don’t remember what makes the other part green. There is some sake in it which makes it Japanese I guess. It was really good and refreshing. Pretty too. The other one I picked for Fannypack (we all know why). It’s called Aka-Fuji which means Red Fuji. It is a variation on the Mojito in that it still have mint and rum, but also citrus-y flavors. It was a bit more bitter than mine but we still liked it. So even though usually we all pick something, I ended up picking three things. 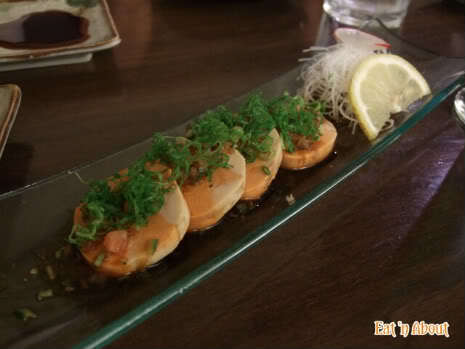 First the Ankimo toted as Sea Foie Gras. 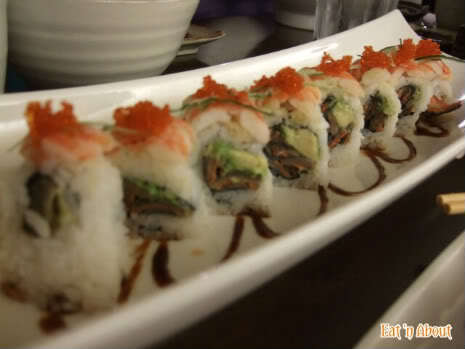 I first had this at Sushi Hachi and fell in love with it. It is so flavorful and rich, not at all fishy (at least on the two times I’ve had it). However, as we know, half of our group is the group that are more picky, finicky eaters. One doesn’t eat innards, the other two are afraid of odors. So C didn’t touch it and W and M were too afraid that it’ll be fishy. All the better for me as I ended up having two. F and O both enjoyed it with me though. It was also a good price. 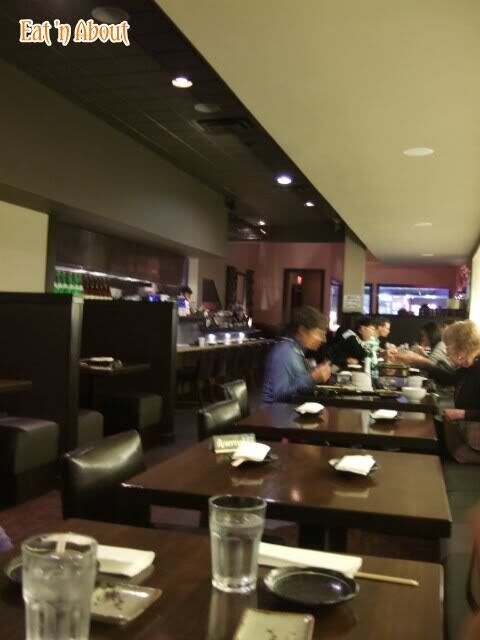 At Sushi Hachi, you get 3 for $6.50. Here you get 4 for $7. The 2nd of my choice was the Renkon Hasami Age ($6.90). 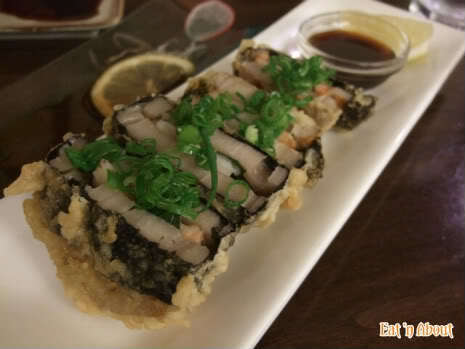 It has prawns sandwiched between lotus roots slices, wrapped in nori and deep-fried. It wasn’t overly seasoned, which was fine as the crunchy lotus roots themselves impart a nice, earthly flavor. I wasn’t too impressed with the prawns though, they didn’t seem superbly fresh. However it had nice presentation and a good dipping sauce. I do like this. I guess I could call this a collaborated decision between me and Fannypack…since it was her birthday I guess I could give her some credit. In reality I suggested it to her and she made the final decision (which is usually “Yes” anyways). 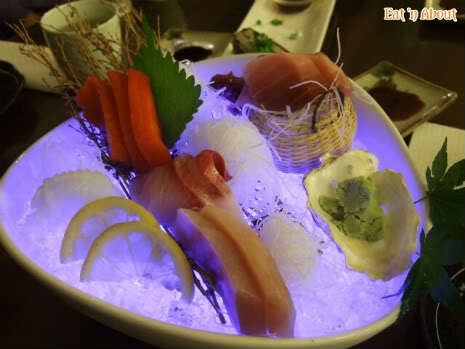 This is simply called 5 Kinds of Sashimi ($24), and consists of the chef’s choice of daily fresh sashimi. On the menu it has the description “‘Achingly fresh’ quoted by Vancouver Magazine” so how could we not order it? Plus M was aching for some Salmon sashimi. So from the upper left (above the lemon slices), is Ika (squid), Salmon, Red Tuna, Tuna, and Hamachi. The presentation was pretty interesting, as it had an eery blue illumination from below. Fannypack loved it. The size of the pieces were average, except for the Red Tuna, that was particularily small, it was approximately 3cm x 3cm. And it was fresh, but I wasn’t aching. 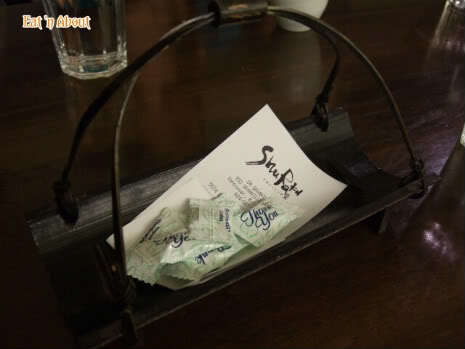 What I did love though, was the cute little basket they used to hold the Red Tuna. Epic cuteness! 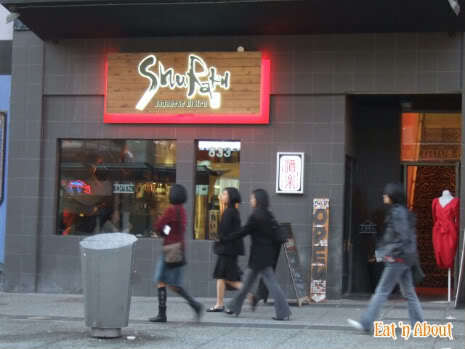 Then here we have the less interesting choices by the other parties involved (seriously, not anything I would order at a Downtown Izakaya place). 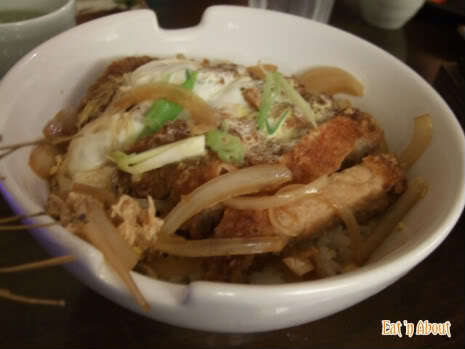 This is the Donburi, and you get your choice of Chicken ($7.50) or Pork ($8.95). W chose Pork. This was average at best. It was good, didn’t taste awful, but wasn’t awesome. What else can I say? M chose two things also. 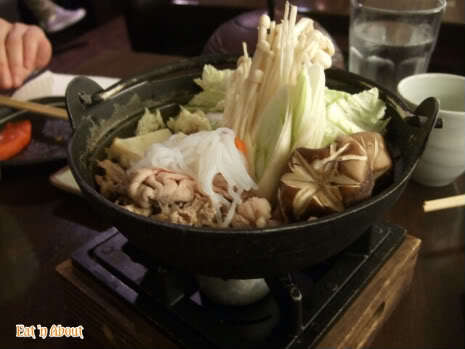 First the Sukiyaki ($8.60). 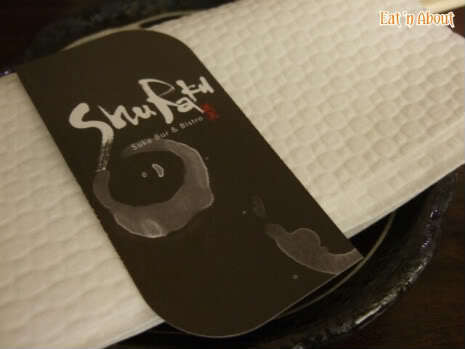 This was slightly more interesting I guess, but after I tried the Toratatsu version, I really wouldn’t have ordered it again at an Izakaya place because I felt it just wasn’t worth it (I’d much rather head to Posh for it). It had the usual suspects of ingredients. I felt the broth was much too sweet though. And the pork burnt at the bottom too. Next were the rolls. 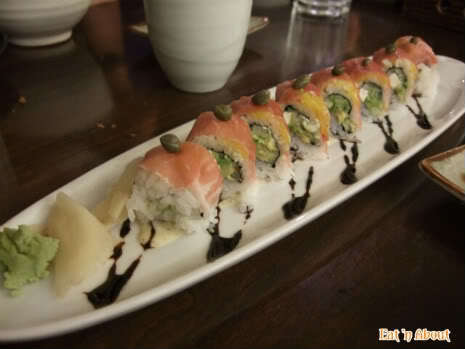 O chose this ABC Roll ($9.50) which is avocado (the A) topped BC roll. It was average at best. The rolls, diameter-wise, were pretty small, but that price is expected from these kinds of places. Aji Taro still has the best BC Roll in my opinion. M’s 2nd choice was the Godfather Roll ($12.50). On the menu it is described as “Avocado, cucumber and cream cheese topped with mango slices, prosciutto ham and capers with kiwi sauce and balsamic vinaigrette.“. I did not taste any hint of kiwi sauce. Rather, it was a type of spicy mayonnaise on the bottom. A gripe about their rolls is that the ingredients aren’t consistent throughout the roll. When we had this, the comments that were made were “Wow it’s very cream-cheesy!”, “Really? Mine was very mango-y.”, “I only had avocado.” So it was difficult to taste all the flavors intended at once. I sat near the end so I almost always got the end pieces which was mostly rice, and avocado. Again, this wasn’t especially spectacular, and it was pricey. This last roll was a last minute order, as we could tell M was still hungry. 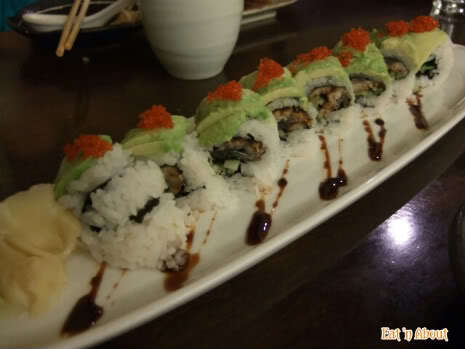 So she chose the Dragon Roll ($10.00) which has “BBQ fresh water eel (unagi) and radish sprout wrapped with slices of avocado, topped with tobiko roe with BBQ unagi sauce.”. This tasted better but I attribute that to the BBQ unagi. Otherwise, the shrimp on top was kinda mushy. So what I learnt is that to not order rolls anymore at these types of places. I don’t know, I never seem to enjoy them that much for the price I paid. The bill came in a cute basket type thing. I think I will come back though. Not for the rolls but for the more interesting stuff. Yah, the rolls don’t look overly interesting. 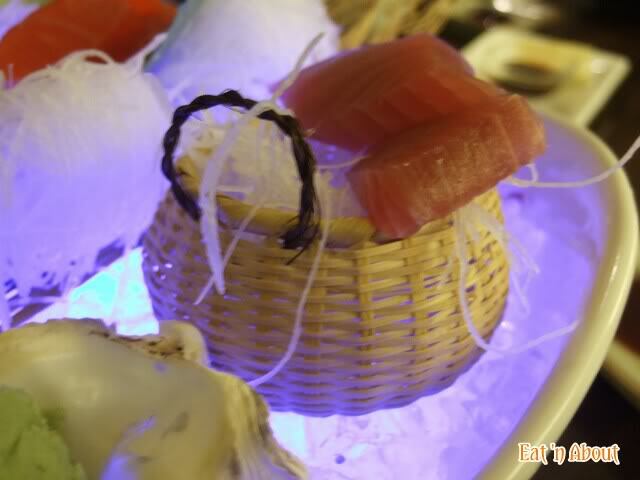 However, I found that the sashimi was a bit expensive for how much I see in the picture. It has to be killer fresh for that price. I guess the price reflects the location?